In S¡nkhya philosophy, mahad or cosmic intelligence creates order in the universe. It permeates every aspect of creation from the gross to the subtle and from the macrocosm to the microcosm, from the order governing the vast galactic universe to the infinitesimal genetic code guiding the unfoldment of life within every living cell. Opening to Infinity According to the S¡nkhya philosophy of creation, there is universal mind, called vibhu, and individual mind, called anu. Universal mind is the ground mind, and individual mind is particular mind. Universal mind is vast, unbounded, infinitely creative and eternally pure, unclouded consciousness. Particular mind is conditioned mind, based upon its stockpile of thoughts, feelings, and emotions stored in memory. Memory is the background to all we think, feel and perceive, and imposes itself upon the foreground of pure, direct experience. The more the particular mind fails to apprehend the ground mind, the more life becomes suffering. The root cause of suffering is this division between the ground mind and the particular mind. Through marma therapy, new pathways are opened within the mano vaha srotas, which allow particular mind to transcend its conditioned state and expand into universal mind. This unity of individual mind and universal mind brings radical transformation and total healing in the life of the individual. At this time in history, important changes are taking place in the Western scientific understanding of mind and body, and of the nature of life itself. The old paradigm, which held that mind lives in the brain, is giving way to a new paradigm that says the brain lives in the mind. The old paradigm assumed that mind is within the body. The new paradigm asserts that the body is in the mind. According to the old paradigm, mind and body are separate and distinct, the concrete, solid, material body being “real” and the abstract, non-physical mind grudgingly accorded a shadowy sort of existence. The new paradigm says that we cannot separate body from mind. The body is crystallized mind, and mind is the energy aspect of the body. To speak of mind and body as two distinct entities is simply not true, and creates confusion and separation. That is why we speak today of mind-body medicine. 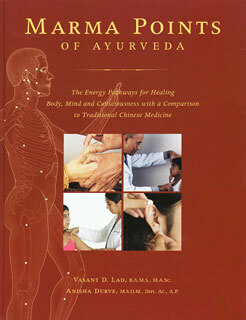 ayurveda has always recognized this. From the ayurvedic perspective, going back thousands of years, we really should speak of mind-body or body-mind, because they are one. This entry was posted on Sunday, March 22nd, 2015 at 4:44 pm	and tagged with Anu, Ayurveda, Body-Mind, Mahad, Marma, Marma Points, Mind-Body, Sinkhya Philosophy, Traditional Chinese Medicine, Vibhu and posted in Anatomy. You can follow any responses to this entry through the RSS 2.0 feed.